These Top 8 Best Arm Exercises for Women will help you tone your arms and ensure you can wear tops with confidence next summer. We always hear guys talking about “the guns” But what about us girls? Disappointingly, the way we often hear women’s arms being described is as the less flattering “bingo wings” or even worse “those tuckshop lady arms” suggesting that women’s arms look flabby, slack skinned and far from toned or aspirational. What is even sadder is that so often women say that they want toned arms BUT at the same time cry out “I don’t want to do weights because I don’t want to get really bulky!” No wonder so many women get confused, intimidated and don’t get the arm toning results that they want. We asked Vitalstrength Ambassador Brie Warnock (aka tankgirltuff) to share her top 8 best Arm Exercises for Women so you too can get a perfectly toned set of pistols. When choosing the best arm exercises for women there are three main muscle groups to focus on during your arm workout – the biceps, triceps and shoulders. These muscles work in conjunction during most arm exercises that is while one contracts, its counterpart relaxes allowing it to do so. For example, during a bicep curl, the biceps will contract but the triceps relax and vice versa so it is important to exercise both to ensure that your arms are not only well toned but exactly the right size that you want them. 1. Stable body position feet shoulder width apart. Arms by sides, palms facing your body. 2. With your arms locked by your side, slowly curl upwards and slowly supinate your palms until they are fully supinated when your elbows reach 90 degrees. Continue curling upwards until biceps are fully flexed. 3. Lower in a controlled manner and pronate at 90 degrees back to neutral at the base of the movement. 1. Stable body position, dumbbells positioned by your side with palms facing your body. 2. Curl the dumbbells upward, keeping your elbows locked by your side, until biceps are fully contracted. Lower in a controlled manner. 1. In a stable body position, place your hands shoulder width apart on the barbell with supinated palms. 2. Keeping your elbows locked by your side, curl the barbell upwards toward 90 degrees then lower in a controlled manner for 7 reps.
3. For the second 7 x reps curl bar upward from 90 degrees until your biceps are fully flexed. 4. Finally, curl upwards from starting position all the way upwards to a fully flexed position for the final 7 repetitions, lowering each time in a controlled manner and for all three stages keeping elbows securely locked by your sides. 1. Lying on a bench with your arms extended and place hands shoulder width apart. 2. Keep your upper arms stable, lower the weight until the bar reaches forehead. 3. Keep elbows pointing straight ahead, return by straightening elbow is positioned above chin. 1. Standing with feet shoulder width apart, lean forward slightly at the hips. 2. Place hands at end of ropes on the knots and pull down at a slight 45 degree angle until elbows are fully flexed. Be sure to keep elbows locked at your side. 1. With your hands on the side of a bench, place feet straight in front of you. 2. Keeping your hips neutral, start with arms straight and slowly bend at the elbows till you reach 90 degrees. Be careful not to dip with your hips – body stays in a straight line. 1. Sit on upright bench with spine in neutral position. 2. Start with arms at 90 degrees to the body, forearms vertical and palms facing forward. Push dumbbells upwards in an arc until arms fully extended overhead. 3. Reverse movement in a controlled manner. 1. Stand in a stable position with feet shoulder width apart. 2. Dumbbells in front of body with palms facing in and elbows slightly bent. Slowly raise the dumbbells away from the body in line with the shoulders until elbow is slightly higher than the shoulder. 3. Lower the dumbbells in same movement in a controlled manner. 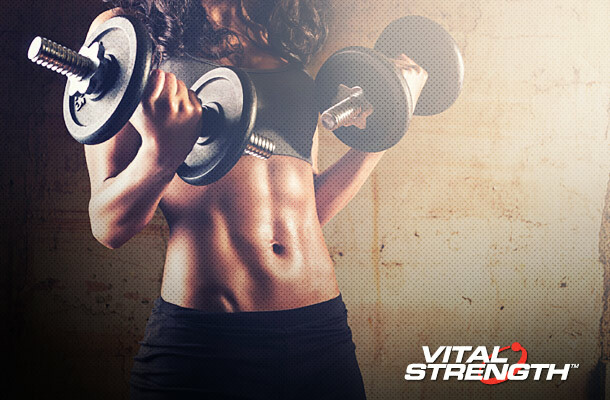 After your arm exercise workout we recommend consuming a women’s high protein shake, like Vitalstrength define women’s high protein to help tone muscle and shape your body. define women’s high protein powder is designed to assist body tone, weight loss and general health and wellbeing.